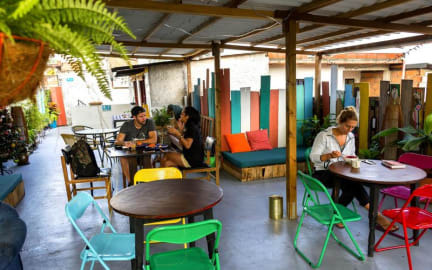 Nice hostel located in Poblado in a very chill and cute neighborhood, quiet bit close to all services and transport. We especially liked the complete breakfast served on the rooftop, the staff and the feeling to be at home. 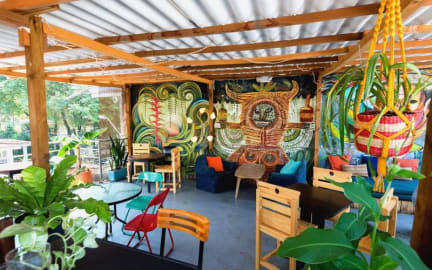 Mixed of street art, pictures and good music, it's an hostel with personality and charm, definitely not standard, but a real place for travel lovers. Super friendly staff, great location in Barrio Manila, and quiet and chill atmosphere. I would stay here again. Really nice hostel. Would stay there again. Location is great, next to the metro a lot of restaurants and bars and clubs. But still really chilled and calm place with a really nice rooftop even though it's right next to the partying area. The rooms we stayed in were a bit sticky. The only bad thing that happens was that we left our drinks and cigarettes on the table for 5 min. alone and the cigarettes were gone. We think the cleaning lady took them but could have been other travellers as well. Best hostel breakfast we had in Colombia - fresh and made to order. The location in Manila is awesome, close to the metro and walking distance to Poblado. Bathrooms clean, dorms pretty stuffy and hot. Only stayed one night before a flight so didn’t spend much time there but dude on the front desk was really nice and chilled. Not as close to affordable food places as further into El Pablado. Rooftop and kitchen looked good. Not enough bathrooms on ground floor but good hostel if you don’t want a party place / want to sleep in Medellin! Upon arriving, the staff was very friendly and nice. There were recommendations for a lot of things to do with postcards, a week’s worth of activities particularly for Medellin/local Poblado activities. Overall people were chill, kitchen was a little dirty.. Staff was helpful in cutting a lock when we accidentally locked it in the locker. Though the initial friendly staff got a little too comfortable complimenting us in a way that made us a little uncomfortable. Great hostel if you're French. Pretty boring if you're not. Private room of what they claimed had a twin bed was a bulk bed without window and with smell of humidity!!! There is a nice terrace but value for money of the private room is not raccomanded! !